No, not that new trend that everybody was getting into a few months back. I’m talking about cooking fish on cedar planks on the grill. For most people, the hardest part of grilling fish is keeping it from sticking to the grates. Another challenge is moving the fish around the grill without it falling into little pieces. 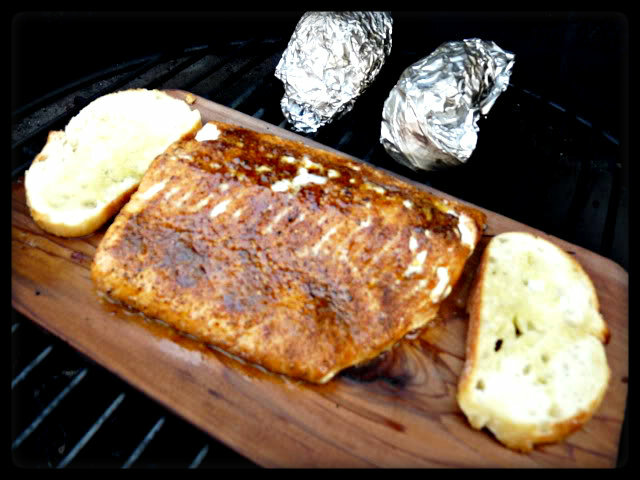 Grilling fish on planks solves both these problems as the fish does not need to be flipped at all. 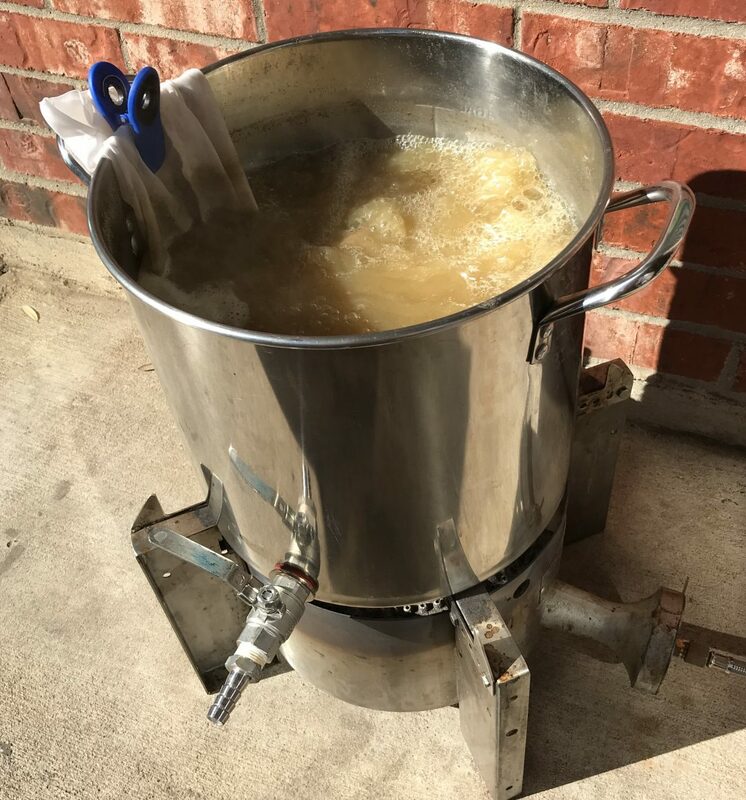 You may need to rotate the plank during the cook to make sure that the fish cooks evenly and if so, I recommend using tongs or a pair of heavy gloves. 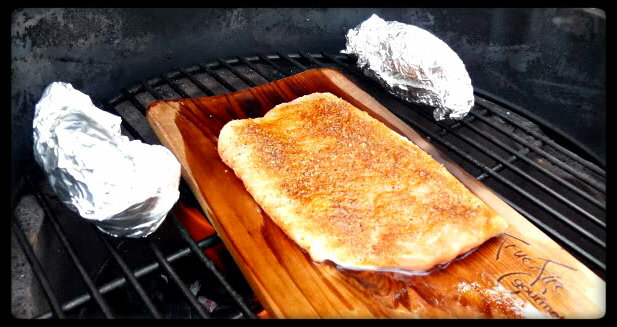 Not only does cooking on planks eliminate the problems associated with grilling fish, it also imparts a nice smokey flavor as the flames char the cedar plank. You need to make sure to soak your cedar plank at least 30 minutes to a few hours before using as this will prevent it from catching fire. Not sure why I have never tried to plank anything before. I heard about it years ago, but assumed it was some gimmic. The MIL gave my Wife a plank earlier this summer that they had bought and intended to use, but never got around to. We decided to give it a shot last night. I found a nice, fresh piece of salmon that weighed 1 pound. We kept it simple by apllying some olive oil, fresh cracked pepper, sea salt and some Dizzy Pig Raging River Rub (I am a huge fan of Dizzy Pig and even though I have not tried all their rubs, there is not one that I do not like so far). I set up The Big Green Egg for a direct cook at 400 F. Once I made sure the temperature was stable, I placed the cedar plank on the grill. After about 3 minutes, the plank began to smoke. At this point, I flipped the plank, applied canola oil to it, placed the salmon on the plank and returned it to the Egg. Wow! Let me tell you, I was impressed. The salmon was perfectly cooked through and not over done. It had a nice crust on it with a slightly sweet and salty taste from the rub and a hint of smoke flavor from the cedar plank and the apple wood chips I used. Mrs. G said it was the best salmon I had ever made for her, so I know we will be adding this to our arsenal. If you have not tried planking before, I encourage you to give it a shot. It is an easy method of grilling that produces fantastic results. Awesome! I am now following your blog! PS. How do you like your egg? I’m just now hearing of it! Wow! You are my first follower. It was your comment the other night that finally convinced me to start this. Love the Egg. Best grill/smoker ever. About to give my gas grill to my parents and already took my old offset smoker to the ranch since I never use them anymore. Looks delicious! My dad can’t seem to get his egg above 350ish. Any hints? Tell him to check the grate that the lump charcoal sits on. A lot of times that gets clogged by small pieces of lump and blocks the airflow. I took a metal skewer and bent it 90 degrees. If I have trouble getting a high temp, I open the bottom vent all the way and take the adjustable top off. Then I take my skewer and going through the bottom vent poke through the holes on the charcoal grate to dislodge and lump that may be blocking the airflow. Depending on how long he’s had his egg and how much he uses it, he might need to take all the insides out and clean out all the ash. Sometimes the ash can fall between the wall of the egg and the center parts and block airflow. If that doesn’t do it, how old is his lump and what brand is it? Keep on grilling and you’ll keep my mouth watering!! Glad Mrs. G was happy 🙂 Very proud of you Bro! Very proud! 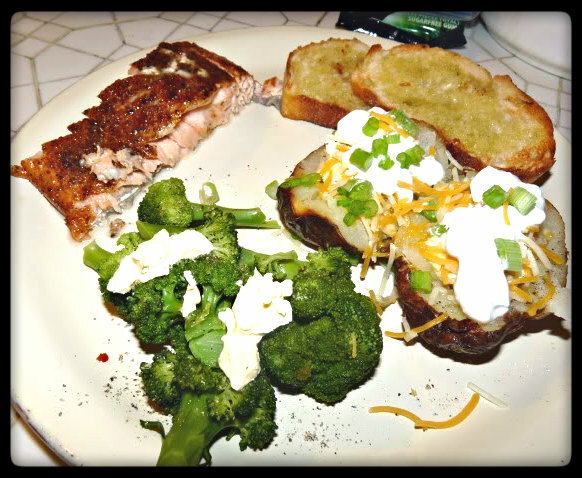 Best salmon you’ve ever cooked for me, Baby! I’m really proud and Egg-cited about your new blog. I bought some salmon and a plank yesterday. Glad I found your post today so I can try this. Hope it turns out as good as your’s looks!